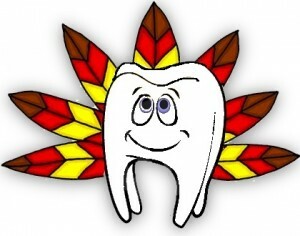 Thanksgiving Dental Tips from Adams and Cheek Dentistry! Happy Thanksgiving! Thanksgiving is a time to reflect on all that we have to be grateful for! And of course indulge in lots of yummy foods! Unfortunately, Thanksgiving feasts can expose your teeth to lots of sugary foods that are damaging to your dental health. Here are a few tips to keep your smile healthy throughout the entire holiday season! Drink LOTS of water! Drink water instead of juice or soda. Not only is it great for overall health, studies show drinking water before meals helps you eat less. Staying hydrated will support healthy saliva flow to wash away food from the teeth preventing rapid plaque accumulation. Cut out the snacking! Thanksgiving meals are known for being large but also lengthy. Exposure time is perhaps the most damaging aspect of a holiday feast. Try to avoid snacking all day and save your appetite (and teeth) for the main meal! Use a bottle opener or a nut cracker! Holidays seem to always be a target time for something to go wrong, and the last thing you want during the holiday season is a cracked tooth! Avoid crunching on ice, cracking nuts, or opening food wrappers or bottles with your teeth. Your teeth will thank you! Brush and Floss! Sticky, sugary foods are in abundance on Thanksgiving tables. After indulging, it is especially important to make sure you brush and floss all of the acid-producing sugar and carbs off of your teeth. Make a Post-Holiday Cleaning Appointment! It is common knowledge that Thanksgiving can be bad for your weight, but the desserts and long meals are also tough on your teeth. If you’re concerned about cavities or gum disease, this winter is the perfect time to schedule a cleaning appointment. One of our hygienists will clean your teeth and Dr. Adams and Dr. Cheek will check your mouth for any signs of disease. Regular dental cleanings help prevent issues before they become uncomfortable. We can also perform cosmetic treatments such as whitening to give you a brighter smile for holiday photos or celebrations. Call us at (919)866-1360 to make an appointment today or click here to request an appointment online! Colgate has some Thanksgiving Dental Tips on “smile healthy” meal choices! Check them out on their Oral Care Center! PreviousPrevious post:Dental Emergency Out of TownNextNext post:I Do Not Have a Toothache…Why Do I Need a Restoration?